This book introduces readers to a revolution in material freedom and radical generosity that will change lives around the world. Alcorn bases his brief, motivational message on the words of the world's foremost financial consultant, Jesus Christ, who advised listeners to "store up for yourselves treasures in heaven" (Matthew 6:20). 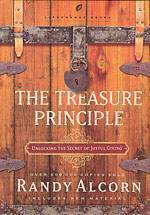 In a concise power-packed style, he leads the reader toward the Treasure Principle mindset by proposing and illustrating key truths. "God owns everything," writes Alcorn. "I'm His money manager. What I call my money is really His. The question is, what does He want me to do with His money?"